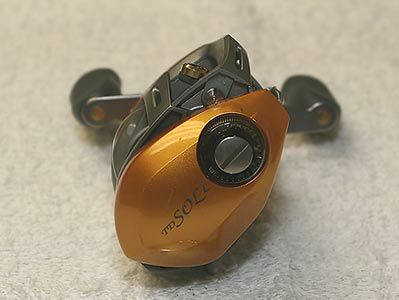 Introduction: Join ChuckE, TT's latest edition to the "TT Gear Crew," for an extremely detailed "how to" article dedicated to the maintenance of one of the most popular palming baitcasters out there, the Daiwa TD-Sol. 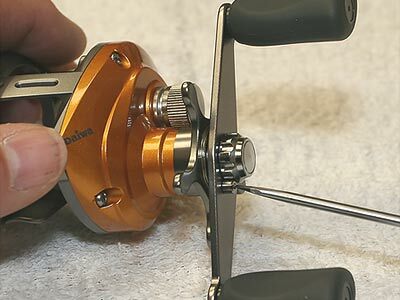 No matter how fine of a reel you are using it is wise to learn how to inspect and maintain your reels once a season to ensure optimal performance over the long haul. ChuckE: Most of the fishing I do in the winter is from the shore, and there always seems to be more of a potential for debris and foreign material to enter the reels that I use at these times. Combine this with the temperature extremes that one encounters in the cold of winter, and you can have a situation where moisture and condensation can form in the reel. I always wonder about the condition of the reels I�ve used in winter, even though they are kept in a heated area when not in use. The following tutorial are the steps I take to inspect and lubricate my reel after a season of fishing under these conditions. 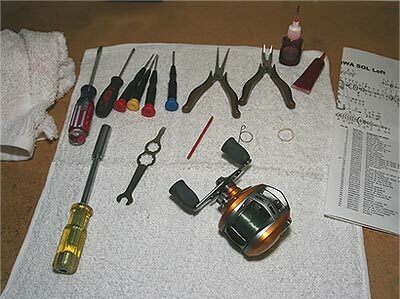 Preparation: I like to have an open area when I work on my reels, and also like ready access to my tools, schematic, and lubes. Before beginning I cover my area with clean and lint-free white terry cloth rags. The texture of terry cloth prevents small parts and pieces from rolling around and becoming lost and white seems to make it easier to see the parts, as they are laid-out. The use of lint-free rags and wipes mitigates the potential for fouling of components. Tools you will need are shown in the picture. Did I say schematic? You bet! I always have the schematic available when disassembling and reassembling one of my reels. 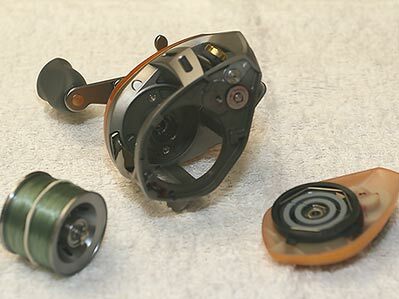 Although the layout and construction on Daiwa low profile reels are similar, the order and placement of small washers and other components can be different. I do not advise doing any type of major reel assembly or reassembly without the schematic. 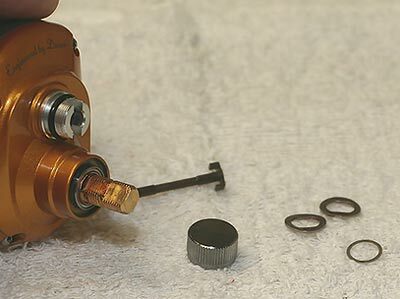 To clarify, the purpose of this tutorial is not to replace operating instructions or diagrams provided with a reel, but simply to illustrate the steps I take to inspect and lubricate my reels. 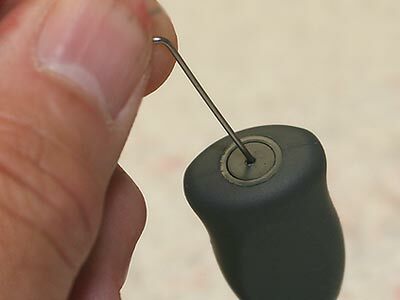 Procedure: To remove the palm plate, loosen the large screw located in the center of the magnetic brake adjustment knob. I like to use a reel wrench that came with one of my Daiwa reels, to initially break the screw free, and use a finger tip to loosen it the rest of the way. (Be careful not to scratch the side of the palm plate or �ding-up the screw head�, with whatever tool you use.) The locking screw is retained to the palm plate and is spring loaded, but should turn easily. Once the screw is loosened the plate can be pivoted approximately 1/8 of a turn to disengage it from the frame and it can be removed from the frame. The spool will often come out with the plate, when it is removed, because of the fit in the anti-backlash magnets. However, just slide it out if it doesn�t. Sometimes the spool pin may hang-up in the pinion gear, so it may help to disengage the spool with the release bar. When you remove the spool, you are actually pulling the spool side clutch bearing from the bearing socket built into the frame, and the fit will be a little snug on a new reel. I like to put a rubber band or piece of tape around the spool once it is removed, to prevent line from spilling off the spool. 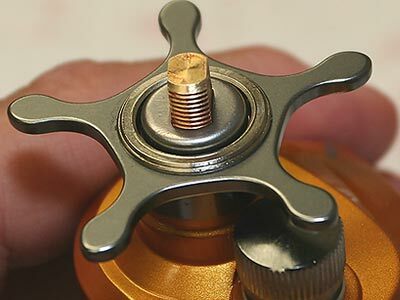 You can check the spool bearings for proper movement, by flicking the bearing attached to the spool with a finger tip, and turning the inner race of the bearing attached to the palm plate with a sharpened hard wood dowel (that doesn�t splinter). Inspect the visible part of the bearing for debris and signs of corrosion. Since the spool bearings in my Sol were very clean and in good condition, the only thing required was to add a small drop of oil to each. 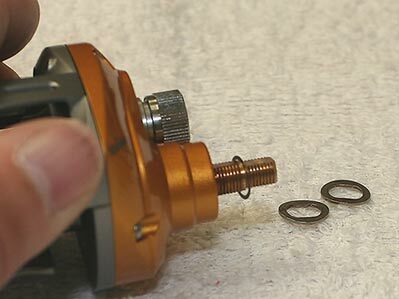 Use a small drop of oil, since excess oil will just spin off the bearing during the first few casts, and will splatter inside the spool, frame and magnets. 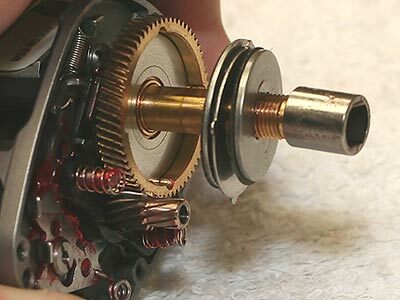 Add the drop of oil to the outside of the inner race so it will flow into the bearing, and then slowly spin the bearing to distribute the oil. Remove the handle by unscrewing the small retaining screw, and remove the nut that holds the handle. 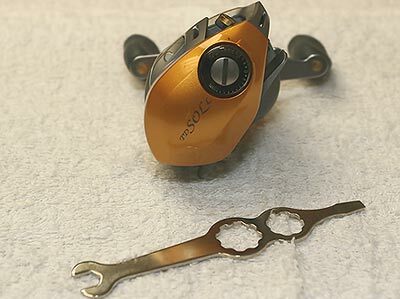 The Sol handle uses a special nut, so the tool that came with the reel will be needed. Remember, that the reel handle shaft has reverse tapered threads, so you�ll want to turn them the opposite direction than you normally would. To lube the knobs on the reel handle you will need to pull the plug out on the end of each knob. You can fashion a small tool from a paperclip, by straightening out one end, and bending it over at a 90 degree angle, approximately 1/8 inch from the end. 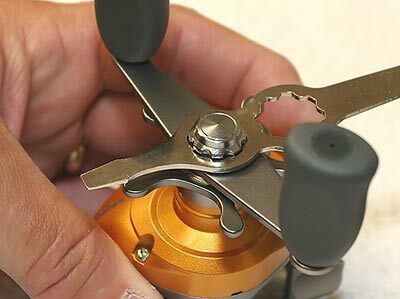 If you have ever upgraded the knobs on a reel, chances are you will already have a plug removal tool, so you can use it instead. 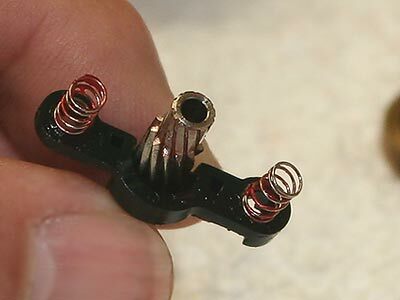 The plugs are friction fit into the knobs, and a little effort may be required when pulling them out, especially if the reel is new. Just be careful when pulling the plugs, so they don�t get lost. The stock handle on the Sol has rivet knobs that have been lubricated with light grease at the factory. 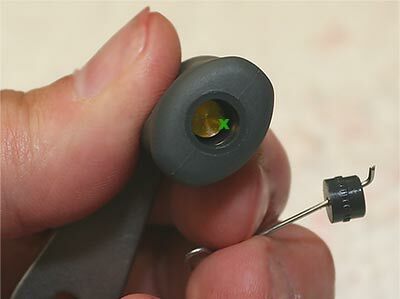 You can add a small drop of oil or a dab of grease to the inside of the knob in the location that is marked in the picture. [As the knobs wear, you can restore some smoothness by using grease.] If you use oil, you can also put a small drop on the bottom of each knob, where the knob meets the bottom of its shaft. Press the knob plugs back in when finished. 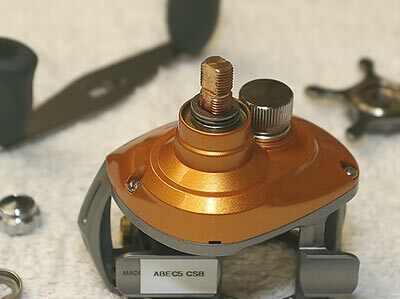 Note: The stock knobs on the Alphas reels are held in place with a screw and can removed for cleaning and lubrication or replacement of the knobs altogether. 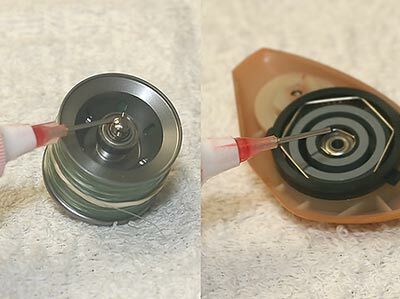 The handle cup washer (spacing sleeve, Part 89) can be removed from the center of the drag star by tilting the reel on its side. It loosely fits on a collar machined on the drive shaft, and should slide right off, unless the handle has been tightened excessively. Once removed, you can remove the drag star by unscrewing it from the shaft (remember it will turn the opposite direction than normal). You will see the drag spring washers on the drive shaft once the drag star has been removed. Notice how the washers are curved and how they are positioned in relation to each other! More on this later�. 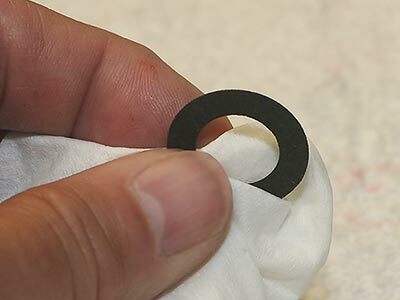 Remove the drag spring washers by sliding them over the end of the drive shaft. Once removed, look for the small bearing washer that rides on top of the outside frame bearing. [It may be difficult to see, since it is usually covered by grease, and may actually look like part of the bearing.] Remove the washer and carefully set it aside, and trust me when I say it can be easily lost! It is so light and thin that it sticks to anything it comes in contact with, and you can spend hours looking for it. It protects the outer shaft bearing from damage by the drag spring washers, and you do not want to use the reel with out it. Remove the spool adjustment cap and remove the pinion shaft. Be careful handling the pinion shaft, since the tabs are subject to damage, especially if worn. Remove the handle plate by unscrewing the three side plate screws. Note how one of the screws is smaller than the others, since this will help with reassembly. I like to use a larger screwdriver to initially get the screws broken free, and then use a smaller bladed screwdriver to remove them the rest of the way. Be careful not to mar or scratch the side plate, since it can be easily damaged by a screwdriver. The side plate can be removed after the screws are out, and I like to do this with the reel on its side (with drive handle up). [This is a habit that I learned on early Daiwa reels. They had very loose fitting parts which tend to �spill out�, if the reel was not on its side while the side plate was removed.] Once the plate is removed, the internal part of the reel will be exposed. Sometimes the outer bearing, gear shaft collar and even the top drag key washer will be left in the plate when it is removed, due to adhesion by the grease. At other times, the collar, bearing and key washer will remain on the drive shaft � so I always immediately remove them no matter where they are, rather than loose them. The yoke, pinion gear, and yoke springs are removed by lifting them from the frame and side of the drive gear. You can remove them all at once by pulling the pinion, or can remove the pieces separately. Just be careful not to loose the springs, they are very small and hard to see on the ground! The drag stack (metal washers, eared metal washers, and drag discs (Parts 77-81)) rests in the 4 keys on the inside of the drive gear. They loosely fit on the drive shaft, and should be easy to remove. 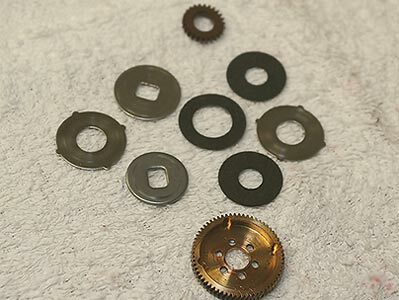 However, sometimes the metal washers will get hung-up and bind on the metal drive shaft as you try to remove them, especially on the threads. Exercise caution so you don�t damage the threads or bend the washers, and they will eventually come off. If you have trouble try removing each one separately. Also note that the black drag discs are very fragile and can break if you bend them, so be careful when handling them. Sometimes when you remove the drive gear, the composite level wind gear will be attached to it. (The level wind gear is held onto the bottom of the drive gear with tabs that fit into holes in the drive gear.) 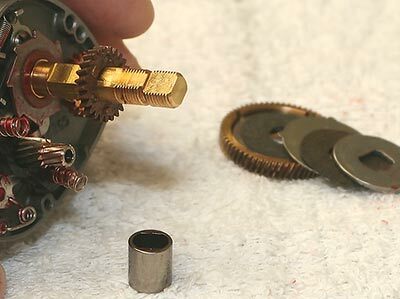 Grease can adhere the two gears together, even though the tabs are not a very tight fit. So, look for this and remove the level wind gear, so you don�t accidentally loose it. The drag discs and washers are not lubricated on Daiwa low profile reels. However with use, the drag components may get wet or oil may contaminate them, which can affect their operation. Carefully lay the drag components out, and wipe each one lightly with a dry and lint-free rag. Again, exercise caution when doing this on the black drag discs, since they can be easily broken. Inspect them for cracks and plan on replacing them if you find damage or excessive wear. Next Section: Daiwa TD Sol maintenance cont.